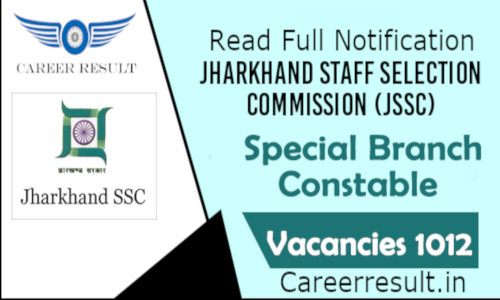 Short Information: Jharkhand Staff Selection Commission (JSSC) invites applications for the recruitment of Special Branch Constable (Close Cadre) Competitive Examination (SBCCE) 2018. Applicants should apply for Jharkhand SSC Recruitment 2019 Online Form 2018 as soon as possible. To get more details of Jharkhand SSC Recruitment 2018 like Education Qualification, Age Limit, Selection Process, Important Dates/Events & other recruitment rules are given below…. Candidates who have completed their Class 12th (Intermediate) Level of Examination will be eligible for this post. How to Apply for JSSC Special Branch Constable Recruitment 2019 Online? After visiting the homepage please click on the option “Online Application for SBCCE-2018”. Kindly register online and keep the login details intact. Fill in the application form that will be displayed in front of you. Check all the details carefully like name, age and category mentioned and submit the form. On the next day at 12 (noon) please log in to your profile and pay the application form. Once the application fee is paid, make sure that you also upload the scanned photograph and signature. After 48 hours of fee payment, please login again and take a print out of the application form. For more detailed info regarding to JSSC Special Branch Constable Recruitment Online Form 2019 kindly visit official website and read carefully employment advertisement before applying against to JSSC Special Branch Constable Vacancy Online Form. Subscribe Careerresult to get latest updates about JSSC Special Branch Constable Recruitment Online Form 2019 on your smartphone via E-mail. For more latest jobs updates in Defence Jobs Stay connected with us.All candidates have to request is to share this job link with your friends over at Whats App, Facebook ,Twitter,Instagram and help them get good career in your life.